ConvaTec Aloe Vesta Cleansing Foam from HealthyKin.com is one product for total body cleansing that is gentle and ready to use. A no-rinse cleanser for all-over body, hair and perineum. 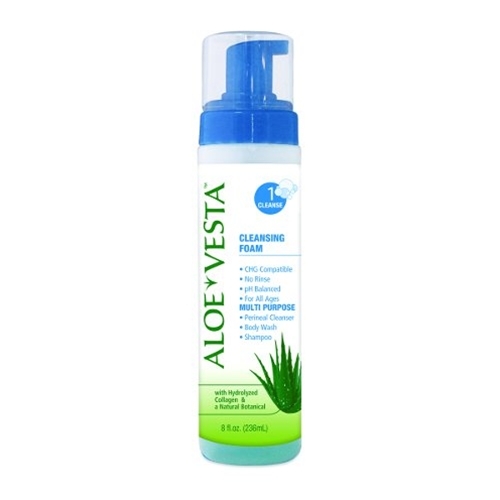 Its no-rinse formula is pH balanced and enriched with aloe and emollients designed to leave skin feeling clean and fresh. This product is outstanding. I purchase it for my sister who is living in a skilled care community. I first was introduced to ConvaTec when she was hospitalized. The community where she is a resident uses a totally different product, but she likes this much better. We have to be very careful what we use since she has so many skin allergies. This is a top notch product. Your pricing is so far better than any other place I have seen, you can't be matched or beat! I used this when in hospital and loved it. I hunted it down for occasional use at home, and especially got camping. This is a great non-irritating, almost odor free product. This is an excellent product. I saw it being used in the hospital, brought the remains of a bottle home, and my mother's caregivers raved about it. Ph balanced, no-rinse foam is extremely gentle and effective. I love this product. I even use it as shampoo. It is truly an overall body wash. I will definitely purchase more. Best product I've ever found! I've been using it for years when caring for my incontinent son. My wife loves and uses your product. Excellent product and I'm so glad I can count on you to purchase it! Great deal! Great price! Thank you!